Award predictions are a staple of preseason reporting across all professional sports, and the fallibility of these predictions is simultaneously mocked and celebrated, as expectations are built to be both challenged and affirmed. Regardless, the practice is, at the very least, entertaining, and the evolution of advanced statistics, especially in the MLB, has improved the ability of fans, journalists and front offices alike to assess more accurately the likelihood of certain outcomes. In spite of this fact, 2018 will not be immune to the parity and surprise that accompany a baseball season, but the following players have been deserving of the baseball world’s attention and commendations in the months following up to the season. There was a spurious narrative making its rounds last season that Kris Bryant had somehow underperformed or disappointed during his 2017 campaign. The numbers tell a different story, however, as the 26-year-old third baseman earned a .295/.409/.537 slash line in 2017, which stacks up very nicely next to his slash line in his 2016 NL MVP season of .292/.385/.554. Though his home run total fell from 39 to 29, his approach markedly improved in the second half of 2017, and he appears to be set up to ride that momentum into the beginning of the 2018 season. In short, Kris Bryant has shown no signs of regression, and the young superstar is fully capable of outpacing the other MVP candidates again in 2018. Mike Trout remains the undisputed greatest baseball player on the planet, so while other MVP picks might be more interesting, picking anyone other than Trout would be ill-advised. Trout missed significant time in 2017 after injuring his thumb on a slide, but he still managed to hit 33 home runs and collect an fWAR of 6.9 in just 114 games —these numbers are indescribably elite. In fact, his 181 wRC+ in 2017 was the highest of his career. Suggesting that the best player in the league could be improving may sound ludicrous, but it could be true. If Trout stays healthy, he will win the 2018 AL MVP. 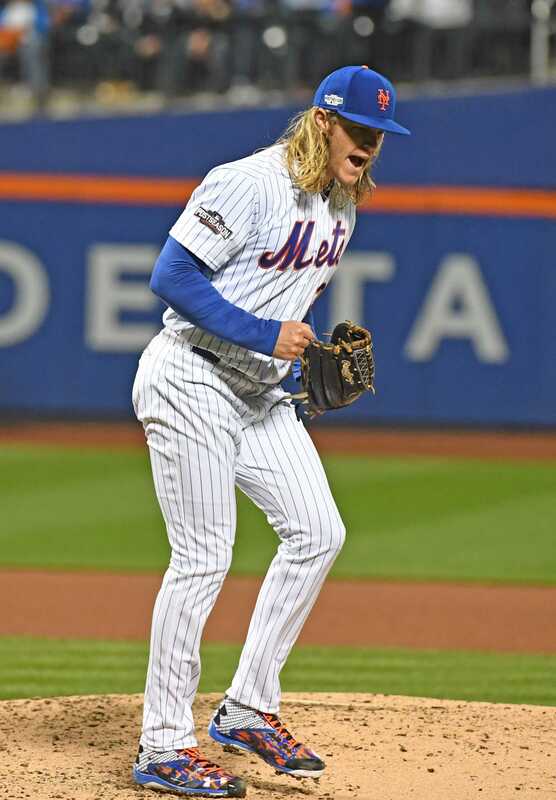 The comedy of errors that has been the New York Mets’ training staff in recent history has distracted from just how dominant Noah Syndergaard has been when he is healthy. Across seven starts last year, Syndergaard possessed an FIP of 1.31, and a larger sample size in 2016 saw him earn an FIP of 2.29. There is plenty of competition for this award in the National League, as Max Scherzer, Clayton Kershaw and Stephen Strasburg all look poised to push for the Cy Young in 2018, but Syndergaard’s elite stuff separates him from the pack. His lat injury should not have any lasting effect, and Syndergaard seems ready to peak in 2018. Corey Kluber and Chris Sale are likely the two most obvious candidates to run away with this award in 2018, and for most of 2017, these two aces were the frontrunners. After an August ERA of 4.38, however, Sale fell out of the race. This will not happen again in 2018. A closer look at the numbers suggests that Sale fell victim to some poor luck in the August, as his 2.43 FIP was much lower than his aforementioned ERA. His strikeout rates last season were also the best of his career, as he posted a freakish K/9 of 12.93. Simply put, Chris Sale knows how to miss bats, and he knows how to do it often. He will continue to do so throughout the coming season. Though the Braves elected to place Acuña on the AAA roster to begin the season for service time purposes, baseball’s No. 1 prospect should make his much-awaited debut in the middle of April. When that day finally comes, the five-tool prospect will finally be on display at the major league level, and his performances in the minors last season and in spring training this season suggest that he is as close to a “can’t miss” prospect as they come. The 20-year-old improved at each level of the minors last season, posting an .814 OPS at high A, an .895 OPS at AA and a .940 OPS at AAA. For what it’s worth, he also recorded an exit velocity of 115.1 mph on a single in the Braves-futures game this spring — a velocity higher than any Braves hit last season. The young star has such a well-rounded set of tools, that even when he inevitably struggles at the plate for periods during his rookie season, his value in other categories can carry him through such stretches. Shohei Ohtani’s underwhelming spring training performance concerned many Angels fans and disappointed proponents of the Japanese two-way star, but his talent is still undeniable. Ohtani routinely touched 100 mph as a starting pitcher in Japan, and he also possesses an effective splitfinger and a cartoonish slider. At 6’5, he certainly looks the part both on the mound and at the plate, and he posted a .588 slugging percentage in 2016 in the NPB (Nippon Professional Baseball). Furthermore, the lack of “sure thing” rookies in the American League this season helps Ohtani stand out, as he has notable experience playing at a professional level, albeit overseas. His season will be heavily reported and scrutinized, and the Angels will have to balance his duties as a two-way player, but if he puts together even a slightly above-average season, he will likely receive the AL ROY nod. If you watched baseball you know Ohtani has virtually zero chance of winning that award. Freezing cold take. You guys should think about trying to fact-check during the editing process. A quick google search says Ohtani is 6’4”. Great journalism!!!! My source was an mlb.com scouting report article (listed below), which reported Ohtani at 6’5, though he is listed at 6’4 in other places.